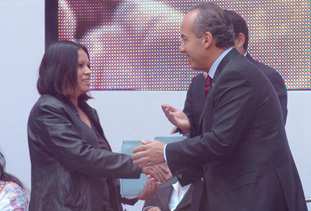 During the International Women’s Day Celebration, President Felipe Calderón declared that his government is determined to construct a more egalitarian Mexico, as a result of which, regardless of the economic crisis, his government will continue supporting Mexican women. He explained that Federal Government has several programs designed to support women, such as the Children’s Daycare Program, the Healthy Pregnancy Program, the Popular Medical Insurance Scheme, Medical Insurance for a New Generation, the 70 and Over Program and Oportunidades. He said that this Program is designed for women and said that it is palpable proof that Federal Government is clearly committed to all the women in this country, since child daycare centers give them access to job opportunities. He reported that in the two years since the program began, 8,200 child daycare centers have been set up. Among the 225,000 mothers who leave their children there, at least 80 out of every 100 who did not have work have now found jobs and earn their own incomes. “The fact that women can work does not weaken but actually strengthens their lives as part of a couple and a family. Their income ensures that women’s dignity is respected and acknowledged, not only at home but also in the community,” he added.